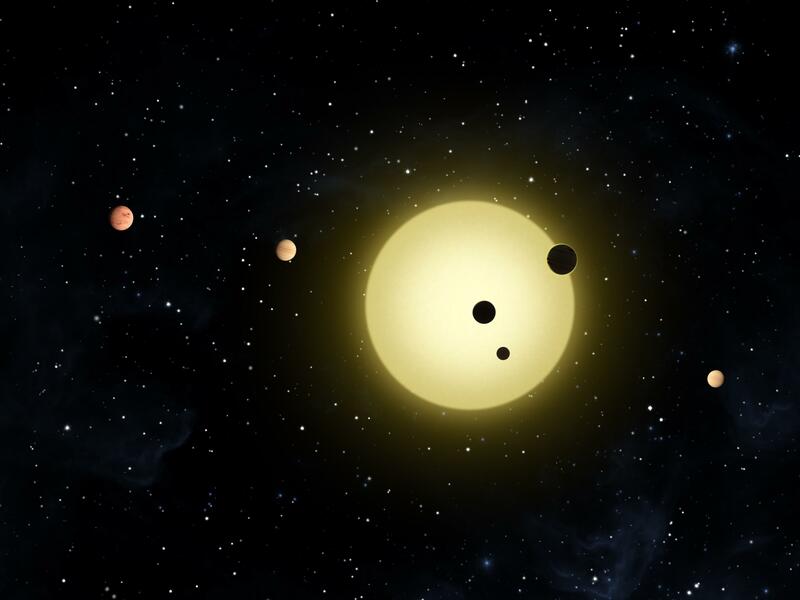 Using data from the Kepler space telescope, scientists have discovered a horde of six planets orbiting a sun-like star, approximately 2,000 light years from Earth. This is the largest group of planets detected so far around another star. The planets in this newly found solar system are relatively small – they range from 2.3 to 13.5 times the mass of the Earth – and are amazing mix of rock and gases. All six planets are crowded within an orbit the size of Venus’ orbit around our Sun; however, the inner five are closer to their star than any planet in our solar system. Lissauer added that the close proximity of the six worlds around the star — now called Kepler 11 — also means that the planets are perturbing each others’ orbits. While having a multi-planet system makes it difficult to untangle the signals from each planet, it has the added benefit of providing more information about each of the worlds. Lissauer was incredibly enthusiastic about the discovery. Kepler finds planets by using the transit method. The planets’ orbits are edge-on as seen from Earth, so when they pass in front of their star they block a small portion of its light. That dip in brightness is what Kepler detects. The time between transits provides the orbital period. To determine the planets’ masses, the scinetists analyzed slight variations in the orbital periods caused by gravitational interactions among the planets. Lissauer said the five close inner bodies tug on one another’s orbit, and sometimes the pull can retard the transit time by 10-20 minutes. Five of the planets’ orbital periods are all less than 50 days, and the sixth planet is larger and farther out, with an orbital period of 118 days and an undetermined mass. Finding a large multiplanet system has many people wondering when Kepler will discover an Earth-like world. The scientists on the panel today estimated it will take three years of Kepler data to find another Earth. Hudgins reminded everyone that the first 15 years of exoplanet searches from ground-based observing produced about 500 planets, and that last year the Kepler team announced 750 exoplanet candidates from just the first three months of Kepler observations. With the release of more Kepler data today, there are now more than 1,200 planet candidates. Translation: this takes time and won’t happen overnight. But with the release of more data, the Kepler team said they wants to harness the horsepower of the whole planetary community, as well as citizen scientists to scour through the data. The Planet Hunters program from Galaxy Zoo has been a successful project that allows anyone to contribute the science of finding extrasolar planets. Oh wow! Keepler at it! Great! If there are so many planets close to the star it could mean thaat there are aa lot of undetected planets further out. Think, a system with around 15-16 planets would be cool. I’ll read that paper [i]pronto[/i]. Also, the lead author is named Lissauer, not Lassauer. I loves me some Kepler! Keep it coming! Perhaps the 3 year estimate for and earth-like exoplanet can be compressed. Can’t wait. No, if by earth-like you mean orbiting at an earth-like distance from a sun-like star: you need 3 observed transits for confirmation, hence 2+ years. A couple of days ago 90 planet candidates and 42 eclipsing binaries candidates got released. All of them found by planet hunters like me. I have 5 planet and 3 binaries candidates so far. I checked around 5000 stars. I wonder how these planets gravitationally affect each other, being so close. @ Manu: See today’s article. I know, I know, there’s still significant confirmation that needs to be done, but still, pretty exciting!